Slice baguette diagonally and thinly spread butter on each. Sprinkle parmesan cheese and paprika. 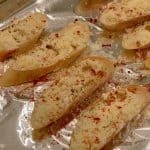 Place baguette slices on baking pan and bake for 10 minutes or so until browned and remove.